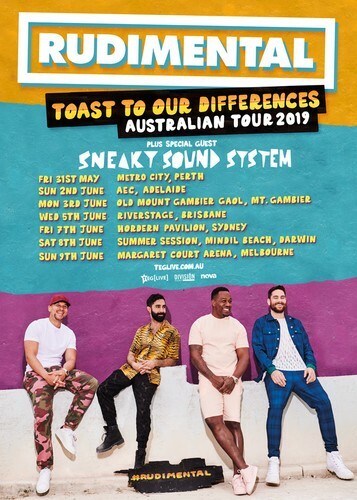 East London luminaries, Rudimental, have announced that they’ll be heading back to Australia for a national tour in May through to June, in celebration of the release of their new album 'Toast To Our Differences' released last January 25, 2019. With over 1.4 billion global streams, 20 million single sales, 40 platinum awards, 22 million monthly listeners on Spotify (ranked 55th artist in the world), 700 million YouTube views and a global audience of 1.5 million+ across socials, there is no doubt—Rudimental are conquering the world and loving every second of it! Their single 'These Days' featuring Jess Glynne, Macklemore and Dan Caplen has achieved more than 2.4 million sales worldwide and has just been certified triple platinum in Australia. The new single with Major Lazer, 'Let Me Live' featuring Anne-Marie and Mr. Eazi is quickly climbing the airplay charts on a similar trajectory to all the other Rudimental singles that have gone before it. There’s a lot of love for these guys in Australia (one of their best performing markets) and it’s been more than two years since the full band last toured the country. But the good news is, they’re pumped to get back to our shores after being reminded of just how fun our Aussie audiences are when they headlined Snowtunes with a DJ set last month. Piers Agget enthuses, "We can't wait to come out to Australia again. It feels like our second home, we're gonna be playing the new album and touring with new singers and bringing a new spin on that Rudimental vibe." Joining the band as the national support will be Sneaky Sound System. Sneaky Sound System have been household names in Australia since the mid-2000s, with massive hits 'UFO', 'Pictures and I Love It' spearheading their 3x platinum self-titled album. In a swirling midst of albums, tours and multiple ARIA nominations, lead vocalist Connie even lent her voice and lyrics to superstars Kanye West, Jay-Z and Snoop Dogg. Sneaky Sound System take listeners on a house music journey—from slow chugging burners to groove‐laden euphoria, amplified by Connie’s sublime vocals. It’s the sound of summer. Presented by TEG Live, Division Agency and Nova.